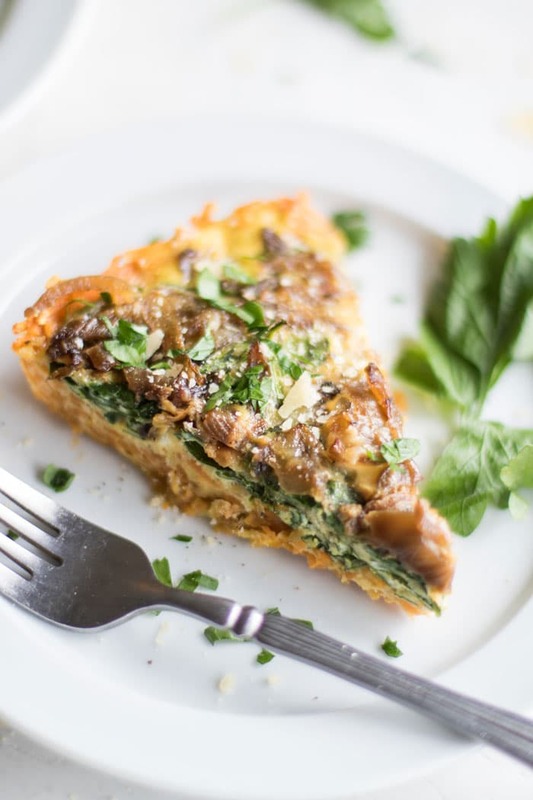 This Sweet Potato Frittata with spinach and caramelized onion is a beautiful and nutritious breakfast. Shredded sweet potatoes are baked into a layer to form a flavorful and healthy gluten free crust. *This recipe was originally published in Sept. 2014. It has been one of the most popular recipes on my blog for over 3 years, so I decided it was time to retest, rephotograph, and make a video! 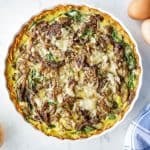 The recipe remains the same, but it has been updated with a few tips and tricks to help you make the most delicious and beautiful frittata possible! Why oh why have I been letting this recipe hide deep within the blog archives for the past 3 years? It’s so easy to get caught up with making something new, that gems like this get forgotten. Not anymore! I’ve now made this 3 times the past 2 weeks, and it’s just not getting old. It’s such a great meal prep option — eat it for breakfast, lunch, dinner … cut it up in pieces and infuse your picky toddler’s meals with superfoods. High in protein, packed with veggies. Win, win, win. In addition to eating this fresh, I’ve been eating it cold (doused with hot sauce! ), and also chopping it up and mixing it into my toddler’s meals (such an easy way to add protein and veggies!). It’s a real life saver to have in the refrigerator. When I first developed this recipe, I had it in my mind that shredding the sweet potatoes and adding olive oil to the pan would result in a hash-like crust. That didn’t happen, but the end result was so good I didn’t care. I start by adding shredded sweet potatoes to a baking dish, covering it with foil, and baking it to soften them up. Afterwards, I press the sweet potatoes down to form a crust, and press it up around the edges of the dish. After the onions are caramelized, it’s as simple as beating some eggs with seasonings, fresh spinach, and parmesan cheese. Layer the egg mixture, caramelized onions, and optional parmesan cheese on top, and bake covered for 30 minutes, and uncovered for another 15 minutes to lightly brown the top. Make it Gluten Free: This recipe contains only naturally gluten free ingredients, and is a great alternative to crusts made from flour. 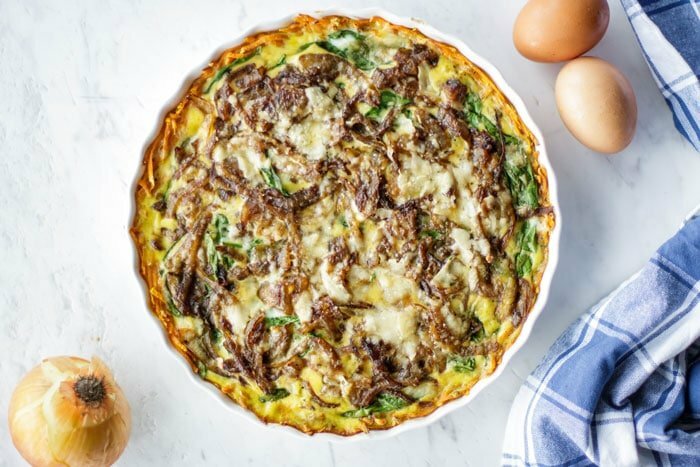 Make it Paleo/Whole30: The caramelized onions add so much flavor to this dish, there is no need to add parmesan. Omit the cheese and you have a Whole30 compliant meal! Make it your Own: This sweet potato frittata can be filled with a variety of vegetables. I used spinach and caramelized onions in this dish because they were what I had on hand! Use whatever it is that you have in your fridge that you enjoy in your eggs – red peppers, broccoli, and mushrooms would all be wonderful. A perfect savory breakfast dish that would be equally good for lunch or dinner. This meal is easily made Whole30 without the cheese, and is gluten free because of the sweet potato crust. Spinach and caramelized onions add tons of flavor and nutrition. Shred the sweet potatoes (peeling the sweet potato first is optional). I do this in my food processor, and it takes seconds. Coat the bottom of a baking dish with 1 teaspoon olive oil. Add the sweet potatoes, and lightly season with sea salt and black pepper. Cover tightly with foil, and bake for 30 minutes. While the sweet potatoes are baking, thinly slice the onion, and add it to a frying pan with 2 teaspoons of olive oil. Cook over medium low heat, stirring occasionally, until the onions have softened. Season with sea salt. If they seem dry, rather than adding more oil, add a few tablespoons of water. Set aside when the onions are very soft and caramelized. 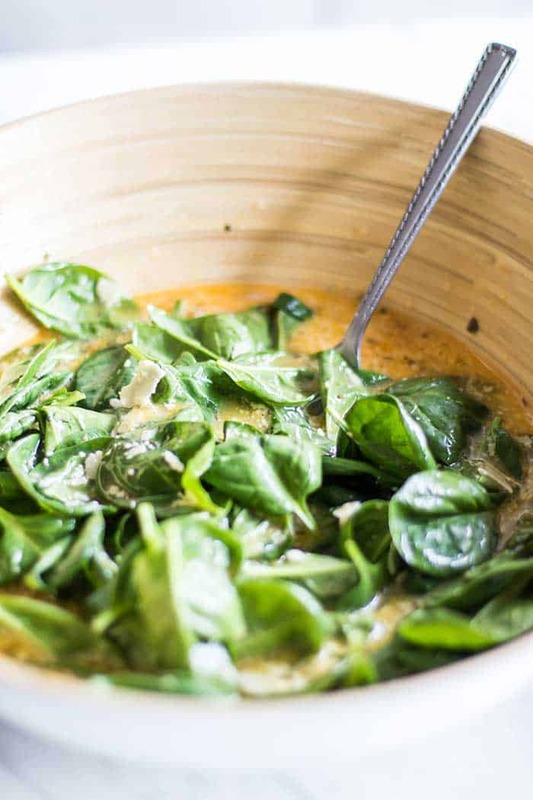 Beat the eggs, and mix in thawed spinach (or chopped fresh spinach), parmesan, and spices. When the sweet potatoes have finished cooking, remove the baking dish, and let cool for 5 or 10 minutes. After it's cooled down a bit, loosen the foil. Use a dish towel to protect your hand from the heat, and compress the sweet potatoes to form a crust. I allowed mine to cool for a bit longer so that I could form the crust up the sides of my baking dish as well, and make the crust more uniform across the bottom-- hard to do when it's very hot! Once the crust has been formed, add the egg mixture. 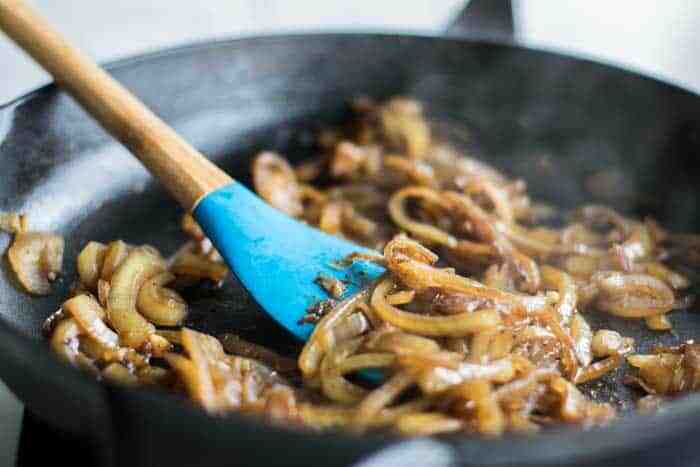 Top the egg mixture with caramelized onions. Cover the dish tightly with foil, and bake at 425ºf for another 20 minutes. Remove the foil, and lower the oven temperature to 320ºf. Bake for another 10-15 minutes, depending on your oven, until the eggs are firm in the center. Sub any type of vegetables for the spinach and caramelized onion. I also love to add bell peppers, broccoli, and mushrooms into my egg bakes. Try subbing white potatoes for the sweet potato. Wow, living in a different country definitely takes some adjusting. Lucky for you that you have these great ingredients waiting to be used. This frittata looks delicious! I just love that you made a crust out of sweet potatoes! Yes, living in a different country takes a lot of adjustment. It's frustrating at times, and amazing all the time! What a great idea for the crust. Very creative! THis looks amazing!!! Onions always make my cry... Oh well... 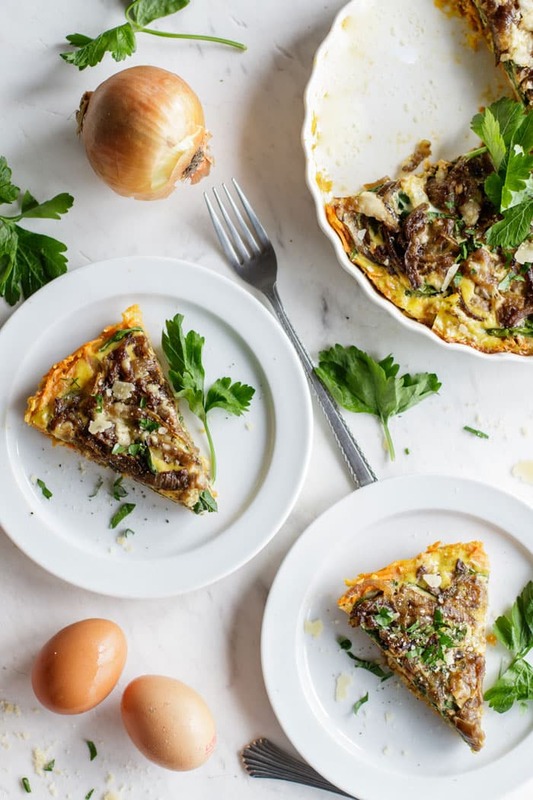 Probably worth it for this frittata! Throw the onion in the freezer for 10-15 minutes before you cut it. It will help with the crying. Or wear swimming goggles - but you will look goofy. That's a great tip, Chad! I am going to have to try it, because it's seriously painful to cut onions, and I love them. Hello! Could you press out the uncooked sweet potatoes into a crust first, then back them like that? Or is it necessary for you to press them out after they're cooked/hot? Thank you! I'm planning to make this for tomorrow! Hello Anna-- I have made it both ways! The sweet potatoes need to cook quite a bit longer than the eggs. If you try to press them down while they're raw, they don't stick together, and when you pour the egg over, it gets cooked into the potato-- like the potatoes are part of the filling, rather than a crust. If you'd like the sweet potatoes to form a crust and the eggs to cook on top, then yes, you need to press the potatoes down after they are cooked. I let mine cool for about 10 minutes before doing that, but I usually am cleaning or doing other things in the kitchen during the process, so don't mind waiting! could you use this crust for making a sweet potato pie or pumpkin pie? How would this work since the sweet potato pie needs to cook a while? I am not sure I would use it for a sweet pie crust. It's sort of like having hash browns with your eggs. If you're looking for a gluten free or grain free pie crust, maybe try one made with almond flour or coconut flour? Lyzel, Thanks so much for telling me this! All the spices you added sound incredible. I'd love to try it that way. And pickled jalapenos are such to make everything better!I've had another reader asking about using it in a sweet recipe-- maybe that's worth a try! Could you use egg whites instead of whole eggs? Hello Anne,I am sure you could! I am not sure how it would change the cooking time. I also probably wouldn't add the spinach if I were using just egg whites, because they tend to get more watery than whole eggs. If you try it and it works, please let me know! I CANNOT wait to try this! I'll be using kale instead of spinach as that's what I have on hand, and will probably try to use a mix of whole eggs and egg whites, but this looks incredible!! Thanks for letting me know Leslie! It's a great dish-- I would love to use kale, but it isn't easy to get where I am living :) Tell me how it turns out with egg whites! Thanks for letting me know Anna! We really love this recipe as well. It's been a super popular recipe on my site since it was posted. I hope you try & enjoy! I'm so excited to try this!! I'm starting Whole 30 tomorrow and can't eat any dairy. Do you think this recipe would work without parmesan? Absolutely! The onions have so much flavor, the parmesan isn't really necessary. Good luck with the Whole 30! This looks delicious, I'm excited to try it! Do you have any suggestions for how to prepare the sweet potatoes if I don't have a food processor? Hi Karla! This is a really popular recipe. I just use the food processor to shred the sweet potatoes-- but any grater will work fine! It works better if the potato is in thicker shreds. Let me know how it works for you! I made this for dinner tonight and my friends loved it! Thank you so much for your suggestion. I will definitely b making this again in the near future. Thank you for letting me know Karla! This is one of the most popular recipes on my site. I love it as well. Im going to make this for my friends brunch at her bachelorette! Question: did you use a tart dish or a full pie dish? Any recommendations on making ahead? Hi Christina! Yes-- and I should add them to this post since it's a frequently asked question! Two options- one is to just make it ahead and reheat it (we actually love eating this cold). 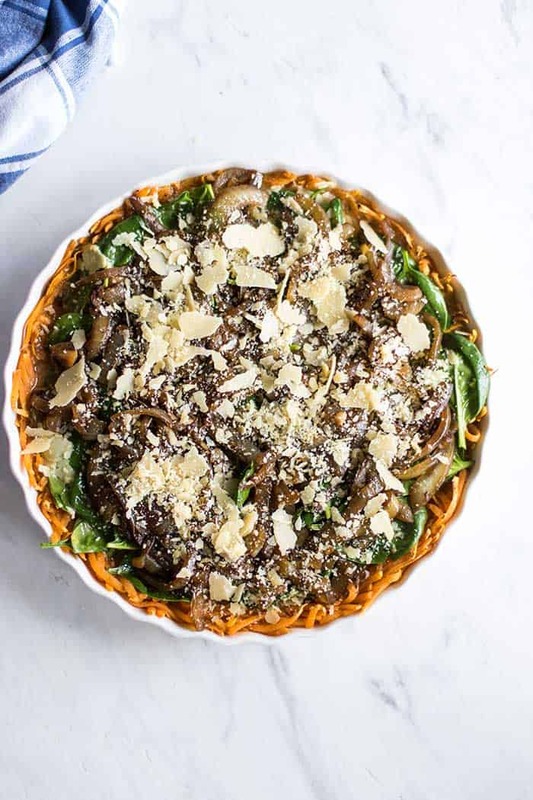 The other option is to make the sweet potato crust ahead, and actually, the egg mixture and caramelized onions can be made ahead also, and then assemble and bake right before you need it. I will let you know when I have the new post up with better instructions for this popular recipe! Thank you! For the reheating option, back in the oven at 350 for 10 min? What do you recommend? Yes Christina, I think 350 is a good temperature- I imagine it would take a bit longer that 10 minutes, maybe 20-- just be careful not to dry it out while reheating. I would wrap it tight in foil. This was delicious! I made it for the week so I will have a premade breakfast every day but I could't wait until tomorrow so I had some now and it was so yummy! I'm actually excited to wake up on Monday morning so I can eat it. I used goat cheese instead of parm because I already had some. I only had to buy eggs and a red onion. Yay! I am so glad to hear that Grace. Goats cheese sounds like a great addition. Thank you for taking the time to let me know you enjoyed this recipe. Looks great. Could this be made without any cheese, or is the cheese a binding factor in keeping it all together? I could substituate anything else in place of cheese? Thanks! I've made this without the cheese and it's great! Not necessary. The eggs provide all the binding necessary :) Enjoy! This is such a delicious breakfast! I love to make it and have it for lunch for several days. Amazing - can't wait to try it!! Thank you so much for letting me know you enjoyed it! We adore it as well. Your addition of bacon sounds perfect.